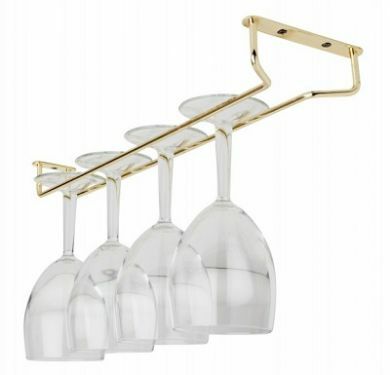 Helping to prevent glass breakage with this highly polished 16 inch brass wine glass rack, perfect for classic and retro style bars looking for an attractive way to store and display stemware. Hanging glasses upside down allows for faster drying, helps to keep glasses off counter tops and prevents dust from entering the glass. Hanging glasses are less likely to be knocked over. Please note: Glasses not included.